Rajendra KC, a senior Agricultural Development Officer, during a field visit to Hari Datta Awasthi's farm in this recent photo. BAJHANG, Jan 30: There was a time when Hari Datta Awasthi of Sunkuda, Bajhang proudly walked with his rifle and a bag of dynamite on his back with the aim of changing the society with his revolutionary spirit. This former deputy battalion commander of the Maoist army is now reinventing his life by starting a vegetable farming in the dry lands of Sunkuda. Awasthi served faithfully for the now defunct People's Liberation Army of the Maoist rebels for ten long years. But even after so much of devotion and dedication, he says it was quite difficult for him to manage a square meal a day. That compelled him to quit his service and start vegetable farming in his own land. Even though there is no proper irrigation facility in his land, it has still not dampened his spirit from doing what he wants to. Life has still not been so much easy for him as he has to walk for an hour to reach to the river from where he gets water for his vegetables. But that has not bothered this ex-commander as he says he is still enjoying this new life. “Earlier, I was interested in playing with guns and bombs but now my interest has switched to spades,” said Awasthi. 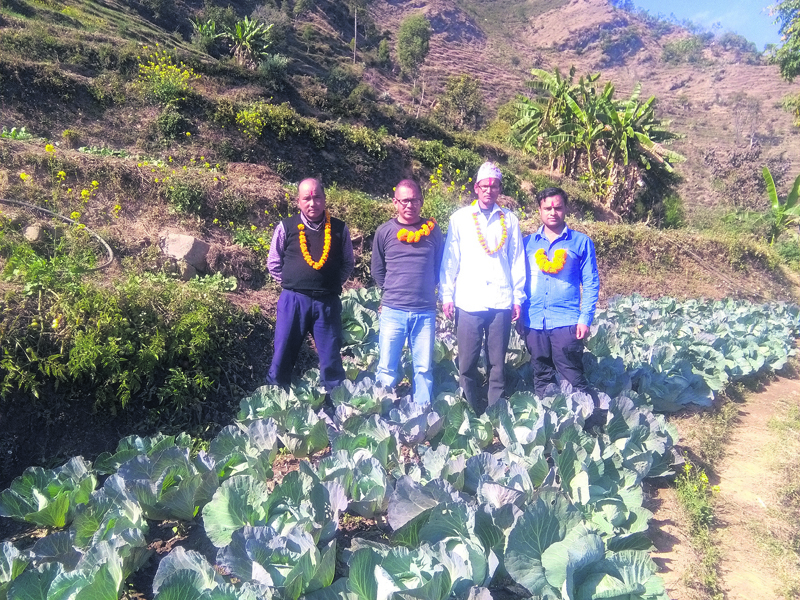 While most of the villagers in his locality are involved in traditional farming of staple food, he seems to be happy with a new approach to vegetable farming. Many people doubted whether he would ever be able to earn enough to sustain his family as he was willing to grow vegetables in a land with no irrigation facility. Awasthi says whatever amount he extracts from his small field has never disappointed him. He is really thankful toward the District Agriculture Development Office for creating a pond for irrigation and also for providing required technical support. He has been honored with the President's Outstanding Farmer Award for his achievement in the agriculture sector. But, he showed his dissatisfaction toward various organizations in the district for not providing any help to the farmers. According to some locals, many organizations take photos of Awasthi's vegetable field to take credit for his achievement claiming that he succeeded because of their support. Awasthi says that he has never preferred using chemical fertilizers and instead uses domestic fertilizers for his vegetables. He has two buffaloes which provide enough fertilizers for the vegetables. Although organic vegetables are in high demand, he has been compelled to sell his vegetables in low price due to lack of proper market. He laments that some of his vegetables are still wasted in the field. The former Maoist combatant believes that all his hard work, passion and sacrifices never paid off when he was in politics. So, he decided to go for a new option. He has five members in his family who are all engaged in agriculture. Sometimes he wonders how this little land made him popular in the village. “As a youth, I spent my days in battlefields and in India. Now, in this new field, it's a totally different feeling but a great feeling though,” he said. Awasthi feels encouraged when locals appreciate his effort and hard work. He has been a great inspiration for lots of farmers. Rajesh Kumar KC, a senior Agricultural Development Officer of the district said, “It's amazing to see the whole transformation that he has been through. No doubt, he deserve it.” A few years ago, no one thought that Awasthi would reach to this height. “We saw him struggling to carry water from the river which is hours away from here. We even saw him carrying vegetables to every possible home to sell but never expected that he would ever be so popular,” KC added. He has been an example for a lot of farmers also because he did everything by his own without taking a penny from others.